To stop Doomsday, Superman fought to the bitter end. But now a new threat surfaces inside Superman's body! 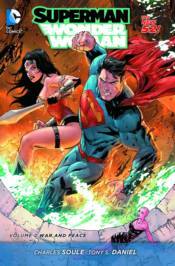 Collects SUPERMAN/WONDER WOMAN #8-12 and ANNUAL #1, plus SUPERMAN/WONDER WOMAN: FUTURES END #1, and WONDER WOMAN: FUTURES END #1.